Obama presidency │ What will happen first? 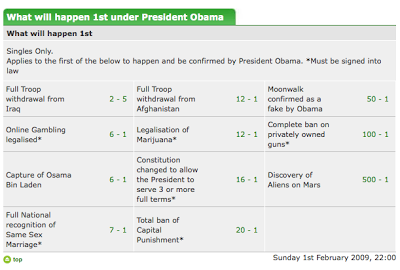 If you want to know what’s likely to happen during the Obama presidency, look no further than the bookies. Paddy Power is offering the following odds. I’m tempted to put down a tenner on Discovery of Aliens on Mars. 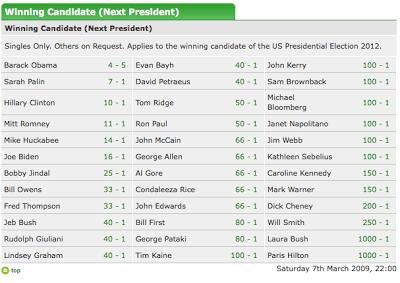 Also, is it worth putting down a bit of money on who will win the 2012 presidential election? Why isn’t Joe the (unlicensed) Plumber / country singer on the list?